For Obesity Day I thought I’d quote the advice Gary Taubes describes as treatment for obesity in the 1950s. Fruit if unsweetened or sweetened with saccharin, except bananas and grapes. When you make the low fat version of food you can do so by adding starch, e.g. Morrison low fat Crème Fraîche has tapioca starch added. 50 million copies of Dr Spock’s book said “Rich desserts , the amount of plain, starchy foods (cereals, bread, potatoes) taken is what determines, in the case of most people, how much [weight] they gain or lose”. And look at Ancel Keys’ observation of the people of Naples eating the Mediterranean diet (though it was the Cretans that were the long lived ones), he describes the small amount of lean meat and the pasta based dishes (a poor region, made even poorer by the war) “The women were fat”. (Ancel Keys was one of the key scientists arguing that saturated fat caused heart disease). So a low carb high fat (higher fat than we eat now) was fairly standard diet advice in the 1960s. Since then the idea that fat is bad is because saturated fat was bad, and because there was some evidence that diets extremely low in fat produced really good results in terms of weight loss, for patients coming off junk food diets (but we’re talking less than 10% fat with no word on whether those are the only good diets). 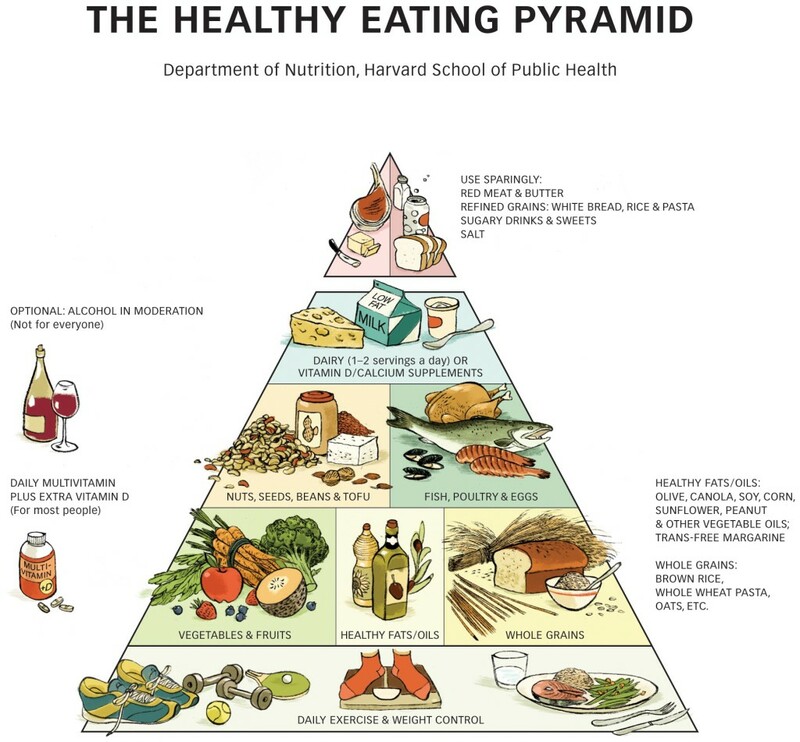 Those diets were studied by Pritikin and they were what inspired George McGovern when he recommended around a 30% fat diet in the Dietary Goals for the United Stats. 30% fat is the current UK recommendation, though the US has now taken the fat limit off. 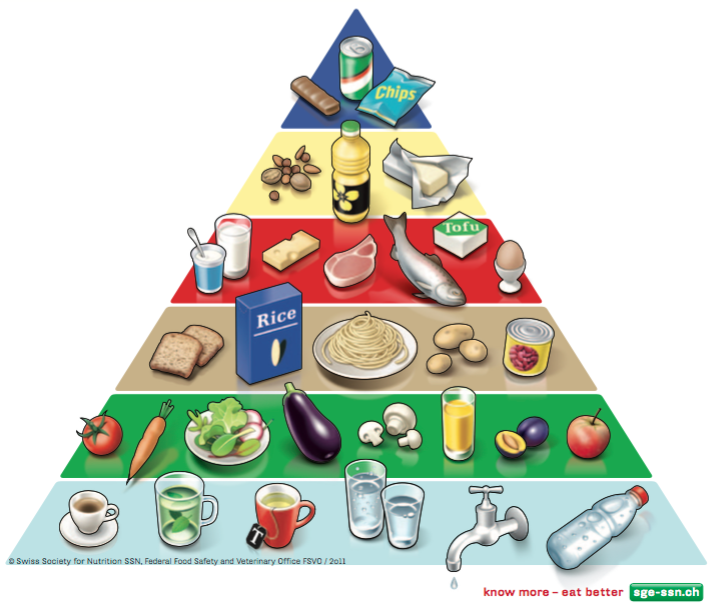 You can see some of the confusion here by comparing the UK, the Harvard and the Swiss food plates or pyramids. 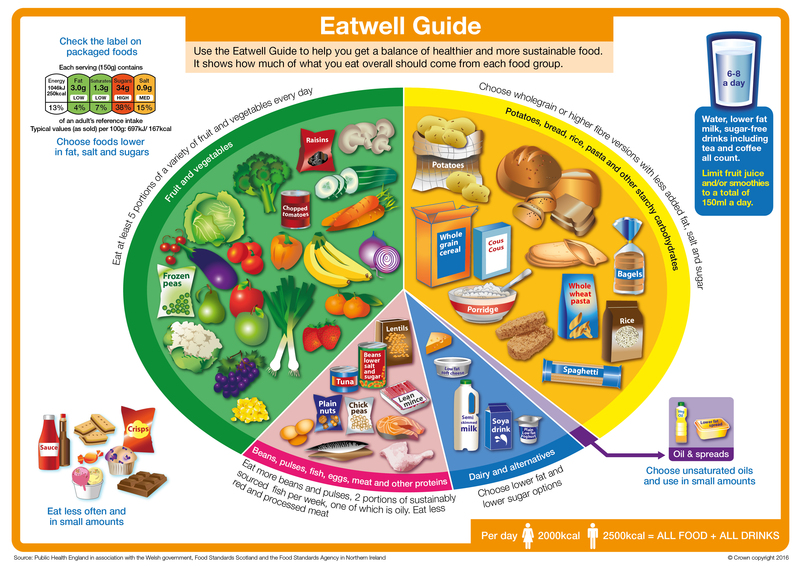 The UK Eatwell Guide is 1/3 carbs and, whatever they say about wholewheat, the pictures are all of highly refined carbohydrates, while in the Harvard food plate whole grains (no processed refined carbs) are 1/4 of the plate. In the Harvard pyramid cheese is in the second smallest category, but in Switzerland it’s one rank down in the middle of the pyramid (quite amusing). Both Harvard and Switzerland pyramids allow more oil than the UK and they disagree about how much. The thing that strikes, me looking at my friends lunch, is how many of them consist of even more than 1/3 carbohydrate. A sandwich is probably around 2/3 bread (carbs) vs filling, or call it half. Then add a bag of crisps, 50% of the calories are carbs, (more than 50% of the weight that’s not water). Then throw in a banana, again as a % of calories thats 92% carbohydrate. E voila, you’re eating way more carbs than are recommended by the UK, and even that is probably too much. The other thing that really struck me was reading Weston Prices’s description of diets around the world. I want to go into this properly in another post, but briefly, he was a dentist who, in the 1930s, did a tour of the worlds teeth comparing ‘native’ diets of people not in contact with Western civilisation, with the teeth of the same ‘tribe’ of people who were. This includes the Swiss comparing a distant valley, Loetschental, with the lowlands, St Gallen, and the Western Isle in Scotland comparing the side of the island with a port and shop with the other side of the island, as well as the Inuit, Native Americans, Aborigines, etc. etc. etc. In every case the ‘native’ diet produced wonderful straight, healthy teeth while the Western diet didn’t. Indeed we’re talking, all your teeth rotting out of your head by the time you’re 20 (and my Swiss grandmother only had four teeth). In every case the major feature of the Western diet was white flour and sugar. These people were eating an utterly terrible diet by any standard (no wonder TB was so rampant in the olden days). Western Price’s main idea was that these people weren’t getting the fat soluble vitamins, A, D and K2 needed for healthy teeth. Also they weren’t getting any other vitamins either (but when he gave them a small amount of top quality butter their teeth got better so it seems it is the A, D, and K2 for teeth). So this is a second argument to reduce easily digested white carbohydrates, that used to be known as uniquely fattening. They are entirely empty calories. If we are sedentary and living in heated homes, we don’t need to eat so many calories, which means the food we do eat needs to be better quality to get enough vitamins, minerals, fibre etc. The final thing, that I’ll try to mention even more briefly before the blog post: What if vitamins A, D and K2 (which need to work together, no point only getting one or two) are so essential for calcium metabolism (as well as teeth) that if we don’t have enough vitamins we have calcium filling up our arteries and becoming atherosclerotic plaques (Atul Gawande described such arteries as being brittle to the touch when he operated on them). What if all of our heart disease is vitamin deficiency? This deserves it’s own blog post. But what if a trivitamin pill could help enormously and saturated fat had nothing to do with it? So for world obesity day, and to save the NHS, make an effort to swap out your bread, pasta, potatos, polished rice and crisps for vegetables, an egg and a bit of cheese.